The increasing awareness regarding the advantages associated with the digital impression technology over the conventional method of impression, such as the simple, easy, and precise scanning with minimum efforts for both, the patient and the dentist, is having the most prominent influence on the global market for digital impression systems. As these systems eliminate the lengthy and painful process of elastomeric impression utilized for dental applications, their application in dental therapies has augmented substantially. Furthermore, the fact that digital impression systems decrease retakes required in dental applications, such as restoration, thus reducing the overall time and increasing the productivity, is also reflecting positively on the growth of this market. Going forward, the increasing production of advanced powder-free intraoral scanners at a much reduced price is expected to propel this market substantially over the forthcoming years. Apart from this, the rising uptake of these systems by dentists, prompted by the increasing focus on patients’ comfort and the accuracy of the treatment, is also projected to impel the market in the near future. In 2016, the market stood at US$2.13 bn. Proliferating at an impressive CAGR of 18.30% between 2017 and 2025, it is likely to reach US$9.6 bn by the end of 2025. Standalone systems, such as plug and play intraoral scanners, and mobile/portable systems, such as intraoral scanners, tablet/screens, and carts, are the main types of digital impression systems available across the world. Mobile/portable systems have surfaced as the leading contributor to this market. In 2016, this product segment held the topmost position in the global market with US$1.02 bn in revenues. Thanks to the novel developments in the dental and healthcare industry and the introduction of various new technologies in the market, such as mobile-based tablet intraoral scanners and 3D impression technology, the demand for mobile/portable systems is likely to remain strong across the world in the near future. Nevertheless, standalone systems are also expected to witness a steady rise in their demand over the years to come due to their low costs and compact designs. North America, the Middle East and Africa, Europe, Asia Pacific, and South America are the prime geographical segments of the worldwide digital impression system market. In 2015, North America dominated the overall market with US$555.4 mn in revenues. Analysts expect this regional market to continue its dominance over the next few years, thanks to the presence of a large pool of established market players. The U.S and Canada are likely to emerge as the key domestic markets for digital impression systems in North America in the near future. With its booming economies and improvement in consumers’ standard of living, the Asia Pacific market for digital impression is predicted to progress significantly among other regional markets in the years to come. The growing number of large orthodontic clinics and practitioners in Asian economies, such as Japan, China, and India, is likely to boost this regional market considerably over the forthcoming years. 3M ESPE, 3Shape A/S, Align Technology Inc., Sirona Dental Systems Inc., PLANMECA OY, Ormco Corp., Glidewell Laboratories, Dental Wings Inc., Densys3D Ltd., and Carestream Health Inc. are the leading vendors of digital impression systems across the world. This report on the digital impression system market provides analysis for the period 2015–2025, wherein 2016 is the base year and the period from 2017 to 2025 is the forecast period. Data for 2015 has been included as historical information. The report covers market dynamics including drivers, restraints opportunities, and trends expected to influence the global digital impression system market growth during the said period. Trends that are playing a major role in the driving the global digital impression system market have also been covered in the study. The study provides a comprehensive analysis on market growth throughout the forecast period from 2017 to 2025 in terms of revenue (value) estimates (in US$ Mn), across different geographies. Digital impression is a technology that uses light emitting diode (LED), lasers or other optical sources to scan intraoral images. It provides three-dimensional (3D) scanned images with high clarity that enables dentists create restorations quickly; thereby speeding up the overall treatment. It helps in eliminating the limitations that includes multiple impressions and wastage of impression materials used in traditional impression. Moreover, digital impression system is an eco-friendly process as it eliminates the need for disposable impression materials and plastic trays. Intraoral scanners help in cutting down the number of steps involved in impression as well as errors. The report offers key industry developments in the digital impression system. Porter Five Force analysis is also included in the report. Value chain analysis which identifies the process of distribution of the product in the digital impression system is also covered in the report. It further shows market attractiveness analysis for all the segments and for all the regions in the scope of study which identifies and compares segments market attractiveness on the basis of CAGR and market share index. The global digital impression system has been segmented on the basis of type and compatibility. Based on type, the market has been further classified into standalone (plug & play intraoral scanner) and mobile/portable system (intraoral scanner, tablet/screens and cart). By compatibility, the market is further classified into third party compatible and integrated. 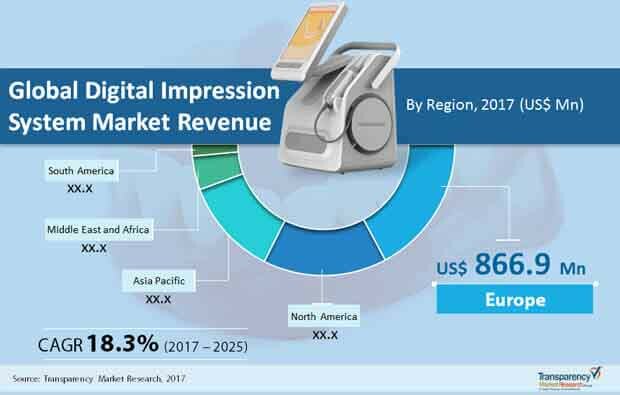 Geographically, the report classifies the global digital impression system market into North America, Europe, Asia Pacific, Middle East & Africa (MEA), and South America; the regions are analyzed in terms of revenue generation. Furthermore, the study also includes quantitative analysis of the competitive scenario for region wise prominent countries which covered in the report include the following - the U.S, Canada, Germany, France, the U.K., China, India, Japan, Australia, UAE, Saudi Arabia, South Africa, Brazil and Argentina. In conclusion, the report presents competition landscape which include competition matrix, market share analysis of major players in the global digital impression system based on their 2016 revenues, profiling of major players (intraoral scanner provider). Competition matrix benchmarks leading players on the basis of their capabilities and potential to grow. Factors including market position, offerings and R&D focus are attributed to company’s capabilities. Factors including top line growth, market share, segment growth, infrastructure facilities and future outlook are attributed to company’s potential to grow. This section also identifies and includes various recent developments carried out by the leading players. The key players of digital impression system market have been profiled with a focus on competitive details such as company and financial overview, business strategies, and their recent developments. The company profile of major players that have been incorporated in this report include as Sirona Dentals Systems, Inc., 3Shape A/S, Align Technology, Inc. (Itero), 3M ESPE (The 3M Company), Carestream Health, Inc., Densys3D Ltd., Dental Wings Inc, Glidewell Laboratories (IOS Compatibility, Inc.), Ormco Corporation and Planmeca Oy.